Premium hand towels for a luxury-class image. This product was made from wood that came from a certified managed forest. Towel/Wipe Type: Dry Wipes; Application: General Purpose; Material(s): Cloth-Like; Number of Plies: 1. 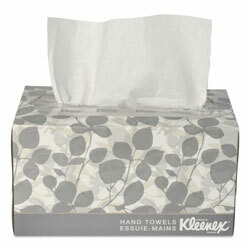 Sheet Size (W x L): 10 1/2" x 9"
White Facial Tissue from Kleenex! 2807 In Stock today.